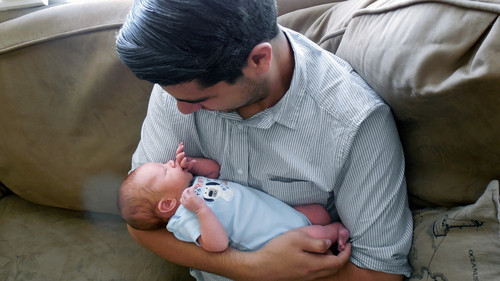 Jeffrey Wright’s solo project Unconditional Arms recently released an album titled “Kinship” made to celebrate the birth of his newborn son, Owen born on August 8th, 2013. The album explores a fusion of ambient, emo and post-rock soundscapes drawing inspiration from Explosions in The Sky and Godspeed! You Black Emperor. With six instrumental tracks, the motivation drawn from the birth of his first-born son is clear with lyrics just not able to convey the incalculable emotions a new child presents. Read Wright’s words about the release below. Stream the album below in its entirety and depending on your location pick up the album here for the EU/UK, here for Japan, and here for the US. The album is available in a variety of different formats and packages including limited edition 12″ vinyl records. For more information check out the project’s website. These days are some of the last days of the fall in Sweden, and the land awaits thick white carpets of snow to wipe off the ghosts of last spring in the form of all the yellow and orange leaves laying on the ground or still holding on to the most reluctant trees. Autumn, in my opinion, is a season that fits very well with post rock, so there couldn’t have been a better time of the year for me to attend a live performance of Explosions in the Sky, whose European tour brought them to Stockholm and onto the stage of Debaser Medis. This Texas band re-defined the genre, becoming almost synonymous with cinematic, emotional instrumental tunes, quickly gaining the reputation of having a killer live show. The music started around 8 with opening act The Drift. I really liked this band, and one of the things that made them so enjoyable for me was that despite the fact that the California trio also are defined as instrumental post-rock, their approach was very different from that of Explosions in the Sky, blessing the evening with some variety. The trio generated a massive wall of sound with the aid of very essential instrumentation (a minimal drum kit, a bass, a guitar and a synth) and their set alternated between static and haunting moments to marching drums and psychedelic rock vibes. Somewhere in between This Will Destroy You and Maserati, but with a retro twist, The Drift entertained (and impressed) the audience of an almost sold out Debaser Medis, (around 1500-2000 people maybe? ), all warmed up for the leading act of the evening. A quick change of instrumentation on stage and curtains opened up again, revealing Explosions in the Sky ready to start their set. A quick introduction speech and the music started with fan-favorite “First Breath After Coma”, the wonderful opener to the band’s album The Earth Is Not A Cold Dead Place. The band’s trademarks are its simple, yet intricate guitar textures that perfectly melt on top of the rhythm section, and I think the musicians definitely live up to their reputation as a great live band, being able to re-create the magic of their formula perfectly on a stage, even adding a lot more energy and dynamics. After the familiar first song, the band moved on to play a track from their new album (Take Care, Take Care, Take Care) called “Last Known Surroundings”, that gets a lot sharper and more aggressive live than on the record, with an extremely distorted e-bowed guitar on a side and a cleaner, more melodic one on the other, all fueled by marching drums and pounding bass. The songs off the new record shine in a different light on stage, bringing in a more progressive feel with overall faster tempo and heavier music. After a brief intersection, the band launched into “Catastrophe and The Cure”, making everyone headbang before abruptly ending with a wall of distortion to set the ground for “The Only Moment We Were Alone”, probably my personal favorite song of the band. One single string hammering the same note on a guitar evolved into an enchanting 3 guitar arpeggio texture and evolved until it reached its emotional and musical climax. Faded background voices and noise introduced “Let Me Back In”, bringing a darker mood to the table along with the older “Greet Death” . The mood then shifted lighter again with the bright, major chords that introduced “Be Comfortable, Creature”. One of the most emotional break-downs of the evening is probably the intro to “The Birth And Death Of The Day”, where walls of distortion turned into a carpet of arpeggio guitars before finally bleeding into “The Moon Is Down”, an epic outro to a really great concert where both The Drift and Explosions in the Sky carried the audience along with them on a musical and emotional journey. Despite being in the post-rock business for over a decade, Explosions in the Sky have released their first ever music video for the song “Last Known Surroundings” off of Take Care, Take Care, Take Care. You can watch the triptastic video at their website here. It’s been a while since post-rock band Explosions in the Sky released their album, All of a Sudden I Miss Everyone, and many questions lurk through the fans’ minds: what has changed in the last 4 years, and how will Explosions in the Sky be able to create new music that is fresh and adds something new to their incredible, innovative discography? Few albums have impressed me at first listen as much as their 2003 album, The Earth is a Cold Dead Place. While Take Care, Take Care, Take Care is quite engaging on first listen, it is an album designed for repeated listens. Drummer Chris Hrasky once said that “I think we just liked the idea of a band that there was not a leader or main songwriter, everyone collaborating and has their own say. I don’t think any of us want the sort of ‘leader role’, so a leaderless band is kind of the best option for us.” A band that doesn’t employ words must use the entire band to make sure that the music can stay radical, and Explosions on the Sky thrives on this. Everyone plays a role in each song instead of having one, main front man for the group. The band members’ technical abilities and musicianship complement each other extremely well. As critical as the guitar is used in their songs to create the melody, the drummer is just as important. Chris Hrasky utilizes his drum kit to create the entire atmosphere for each song. In the track, “Trembling Hands”, the drumming is so momentous that it is the focal point of the song. “Trembling Hands” is the only song that utilizes vocals in Take Care, Take Care, Take Care, and it is the first time in six years that they have done this. The one and only other time they have done this was in “Day Two” on their experimental eight-day project, Travels in Constants, Volume 21: The Rescue. “Trembling Hands” is a track that is much different than the rest of the album, and discography. 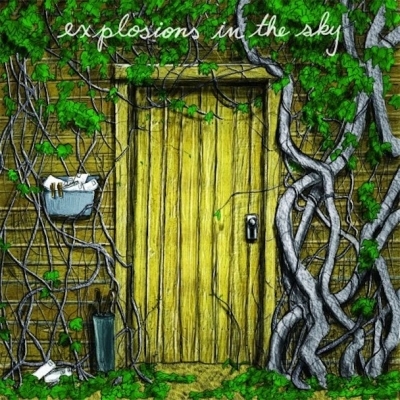 The singing, along with the drums, gives the band energy that has never been heard before in an Explosions in the Sky song. It is probably the most inventive song on the album. In a few days on April 30, Explosions in the Sky will be playing at Hollywood Forever Cemetery to promote their new album, Take Care, Take Care, Take Care. Post-rock is a genre of music that is normally made to be very despondent and tragic, so playing the album at that venue will be quite fitting. “Human Qualities” seems to be a rather quiet and desolate song. However, this long 6 minute and 49 second build-up makes the last minute incredibly awe-inspiring. Explosions in the Sky does a good job of this in Take Care, Take Care, Take Care. Explosions in the Sky fabricate songs that are not only melancholy, but they also create songs that are extremely inspirational and hopeful for its listeners. For the genre of post-rock, it is not the band that always chooses the meaning of the music, but rather the listener to discover how the music impacts them. Explosions in the Sky connect their listeners to an emotional level that can sometimes never be done with words. With the exception of “Trembling Hands”, not much has changed in this album. For a band that is so inherently inspiring to others, Explosions in the Sky does not attempt to achieve many new heights. You could probably compile Take Care, Take Care, Take Care along with their first album, How Strange, Innocence, and not notice a difference. However, this is not a problem for Explosions in the Sky. If not changing their musical direction is a problem, fans would be complaining by their second album. Explosions in the Sky seem to keep faithful to their fan base by giving their supporters what they want. With the release of Take Care, one has to wonder what’s next for this band? For now, the band that seems to be going nowhere but up, will keep themselves playing shows alongside Arcade Fire and a countless number of festivals such as Bonnaroo and Lollapalooza. Post-rock band Explosions in the Sky has just released a stream for their new album in its entirety on their website here. The band is releasing their new album, Take Care, Take Care, Take Care, on April 26. They will begin a USA/European tour on April 30th and you can read more to see the tour dates. Four years after the Texas-based post-rock band Explosions in the Sky released All of a Sudden I Miss Everyone, they have finally released a new song. “Trembling Hands” is the first official single off of Take Care, Take Care, Take Care, the band’s sixth official studio album. If you’re already familiar with the band’s old music, you will know that this song is much different from their past work. First off, this song is no more than four minutes long, which is fitting for a single, but odd for an Explosions in the Sky song. Also, instead of having a long, monumental build-up, the song immediately starts out upbeat, with the drums kicking in from the beginning. Another thing to note is that this song has very faint, but distinguishable vocals. However, this song still has what Explosions in the Sky fans have been craving for for years: vibrant guitar riffs and ornate soundscapes. “Trembling Hands” is an energetic song which shows that the band has definitely changed their overall sound over the years. This song could be a good example of what the new album will sound like, but is it for the better? That’s for you to decide. If you haven’t heard the song yet, you can download it here for free or below. Explosions in the Sky‘s sixth studio album, Take Care, Take Care, Take Care is officially available for pre-order on their website. They have also released their first official single, “Trembling Hands”. Pre-order or download “Trembling Hands” at Explosion in the Sky’s website here.